Microsoft ever foray into the tablet industry in 2010 with the Slate. 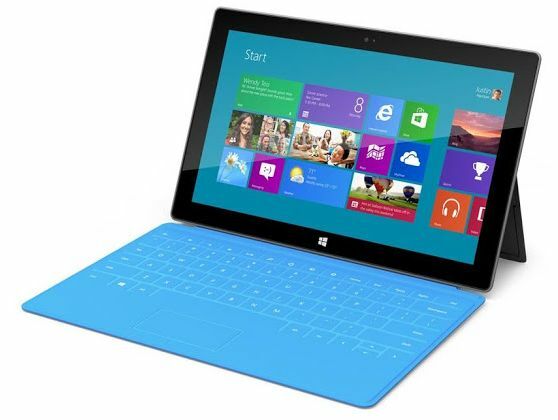 Currently, Microsoft is back with a Microsoft Surface. It has a dimension of 274.6 x 172 x 9.4 mm and weighs 680.4 grams, NVIDIA Tegra 3 T30 chipset, CPU Quad-core 1.3 GHz Cortex-A9 ULP GeForce GPU and will give you the freedom to enjoy thousands of applications that have been marketed in the Windows Market. Microsoft Surface consists of two versions, the low-end version that uses Windows RT, and high-end versions that use Windows 8. Surface Windows 8 has a thickness of 13.55 mm and weighs 903 g, while the Surface RT has a thickness of 9.3 mm and weighs 676 g. Both use a screen of 10.6 inches. Case "Touch and Type Cover"
One of the highlights of the Surface is the case "Touch and Type Cover", which will automatically stick to the tablet using a magnet. Almost the same as the Smart Cover from Apple, just added a keyboard that can be folded. With the help of this case and feet found in tablet, tablet Surface can be converted into a laptop. Surface RT will use ARM-based CPU, while the Surface Windows 8 using third-generation Intel Core processors are more powerful. For storage, there are several options ranging from 32 GB to 128 GB. MicroSD slot is also available as well as access to Microsoft's SkyDrive which is Microsoft's storage shed. Currently pre-order Microsoft Surface has been opened, but only available for a few countries. And the delivery was expected to be held on 2 November. In the UK, pre-order prices start from £ 399 for the 32 GB version, £ 479 for the 32 GB version with a touch black cover, up to £ 559 for the 64 GB version with a touch black cover. You have finished reading Microsoft Surface ( Tablet ) and many articles about Tech Gallery in our blog this, please read it. and url link of this article is https://littlebitjohnny.blogspot.com/2012/12/microsoft-surface-tablet.html Hopefully discussion articles on provide more knowledge about the world of new tech gadgets.